The real star of the beachside Hangout Festival in Gulf Shores, Alabama, is the gently rolling Gulf of Mexico just a few sandy towels away from the main stage; it’s the nesting turtles making surprise guest appearances; it’s sand as a bench, beer cozy, blanket and footwear. It’s enough bare skin to make Coachella look like a convent. But there’s some bands too. Here’s the six best we caught on Friday: Don’t miss SPIN’s best live photos, straight from Hangout Fest’s beautiful shores. 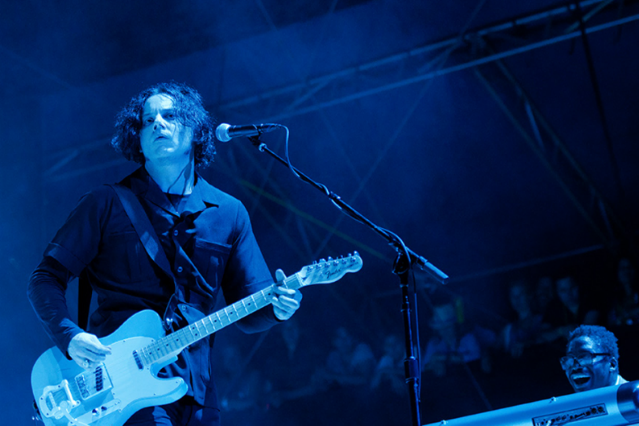 The first show after sending a ridiculous press release boasting “JACK WHITE ATTEMPTS NEW WORLD RECORD” was nothing to call the Guinness people about. The challenge to “every night on stage attempt to break the world record for most metaphors in a single concert” was a bust. There are more metaphors in the first 10 minutes of an AC/DC concert — unless, “Does it sound good out there? Everybody got something to drink?” is some metaphor we’re missing. Hell, even his raucous take on the Dead Weather’s “I Cut Like a Buffalo” technically featured a simile. The homestate homeboy comes back to ‘Bama for a victory lap. He showed off all his Alabama tattoos one by one, he repped for his old trailer park, he beamed enough Yellowhammer State pride to have the crowd in the palm of his hand. There was fist-pumping and bouncing all the way to the back of the Xbox tent for the entirety of his 70-minute (!) set full of people trying fruitlessly to sing along to the hyperkinetic chorus of “Trunk Musik.” But three things got this crowd especially bonkers: The “Talledega Motor Speedway” line in his cult hit “I Wish”; an a cappella version of his legendary BET cypher; and a heartfelt sing-along of Beastie Boys hits. Or more accurately, a “roar-along” since the entire tent, imbued with emotion, yowling along to “Fight For Your Right,” led by the most famous rock-bred white rapper of 2012, was maybe the loudest thing we heard all day. Bookending a string of Beasties classics (“Brass Monkey,” “Intergalactic,” “Paul Revere”), Yela led the crowd in game of full-contact karaoke that touched all his influences — “Riders on the Storm,” “Folsom Prison Blues,” “Master of Puppets,” ” Boyz-N-The-Hood,” “B.O.B.,” “My Name Is,” “Simple Man” — that just made the already frenzied crowd go crazier. “Feel free to crowd surf,” he said. 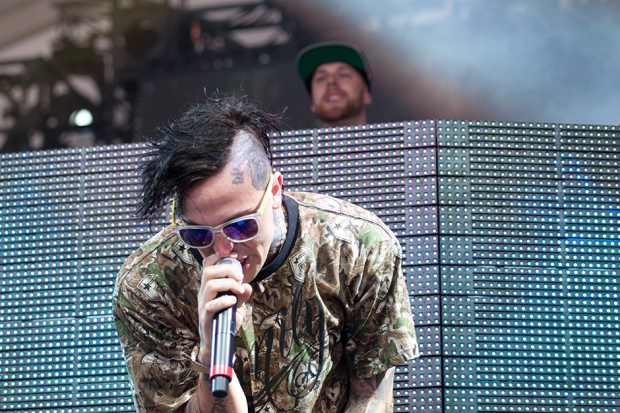 “Welcome to the Yelawolf show.” C.W. Before he played a note, our broodmaster emeritus led with, “Thank you for letting me interrupt your cool Hangout by coming out here wearing all black and playing some depressing songs.” Granted, it was hilarious to see him sulk his way through “Fell on Black Days” while a pelican soared past the setting sun. But the audience refused to let this be a somber affair — when one audience member was caught on the JumboTron deeply emoting to “Black Hole Sun,” she cracked up and the audience did too. And, anyway, Cornell caught the chill, feel-good, brotherly vibe of Hangout very quickly: opening with Elvis Costello’s “(What’s So Funny ‘Bout) Peace, Love, and Understanding” and closing with (seriously!) John Lennon’s “Imagine.” His slow, drawn out run through Temple of the Dog’s “Hunger Strike” was like a campfire croon-along, Cornell doing Vedder’s parts, and the audience doing Cornell’s. (One of the best parts of a Chris Cornell show is listening to an audience trying to hit the high notes in his impossible range). For one song he allowed himself to be unencumbered by a guitar, playing 1999’s “When I’m Down” just singing along to Natasha Shneider’s original piano part while it played on a Stanton turntable, a tribute to the pianist who died 2008. His one turn as “frontman” instead of “solo artist” was the show’s most naked, honest, and striking moment. C.W. 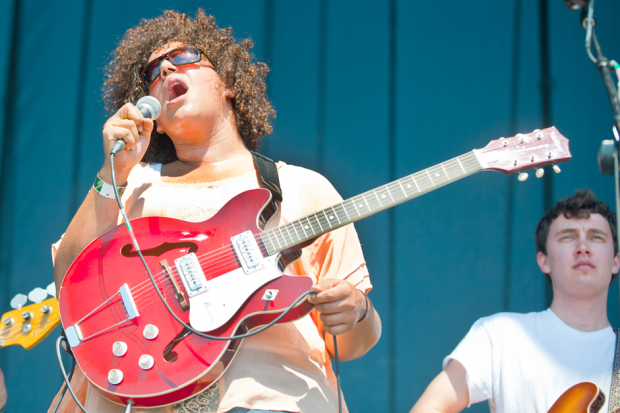 Brittany Howard, sporting in green sun visor, greeted the hometown-ish crowd — the Shakes hail from Athens, Alabama, on the North side of this fair state — with a five-second-long primal yowl, then launched immediately into the situationally appropriate “Hang Loose,” a country-soul jangle from their self-titled debut. The set that followed featured a generous helping of new tracks, including the swaggering “Hurricane Strut,” and a wild, piano-led rave-up called “Making Me Itch,” along with soulful slow-burners from their debut like “You Ain’t Alone” and “Hold On.” The more nuanced tunes allowed Howard to show off her vocal arsenal of coos, cries, whispers and howls. She gave the fiery southern rocker, “On Your Way,” the full-throated gospel treatment, while “Rise to the Sun” built from a moody ballad into an stuttering, explosive stomp. Howard didn’t always look entirely in her element in the bright sun at the beach — late nights in dank bars seem more her speed — and toward the end of the set, she admitted as much, telling the audience, “I ain’t been to the beach in so damn long! I ain’t taken a vacation in so damn long! This is beautiful!” Guitarist Heath Fogg though was at this very beach a year ago. After the set, he told me he came to the previous Hangout with his girlfriend, but as a fan. “I had a backpack full of demos ready to distribute to everybody,” he said. What a difference a year makes. D.P. Ward had his work cut out for him when he stepped on stage around 5 p.m. A good portion of the crowd was either seated or lying on the sand; a few folks had nodded off. His opening tunes, which included the lovely, melodious “Poison Cup,” seemed intended to only gently rouse them. But when the shuffling “Chinese Translation” descended into a wild guitar jam, Ward might as well have been kicking sand into their collective faces. He delivered his Monsters of Folk cut, “Whole Lotta Losin’ ” with a wonderfully nasty edge, and even country-tinged tunes like “Helicopter” and “Four Hours in Washington” reliably transformed into noisy guitar workouts, with pedal steel player Chris Scruggs trading snarling lines with Ward. 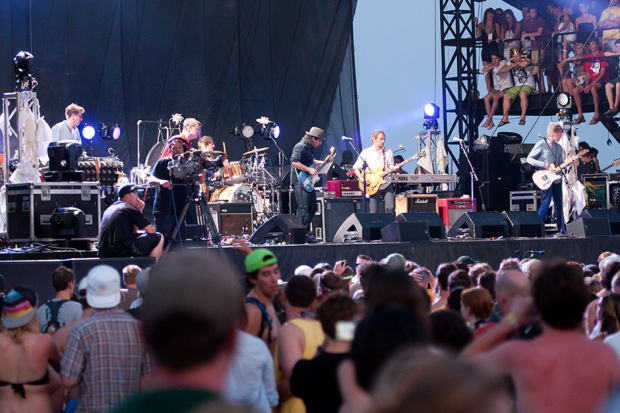 At the end of the set, much of the previously prone crowd was upright. The Texas swing of “I Get Ideas” got some of them moving their feet, and by the time Ward closed with a raucous cover of Chuck Berry’s “Roll Over Beethoven,” a few were even dancing. D.P.